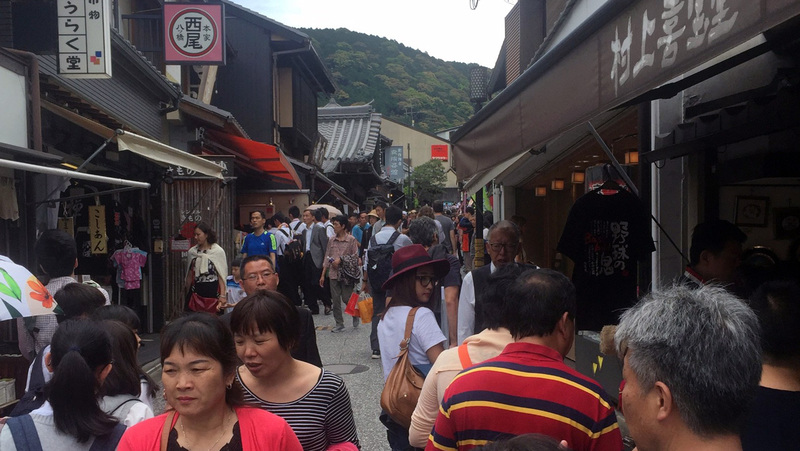 If you’re going to Japan, most people will recommend two places, Tokyo and Kyoto. While I have a place in my heart for Tokyo, if I had to choose between them I’d always choose Kyoto. It’s less crowded, has more history, and it’s easy to walk just about anywhere you need to go. I really don’t like talking to people. I love nature and quiet spots to sit and be alone. I’m vegetarian so I tend to eat at vegetarian-only or very vegetarian-friendly places. 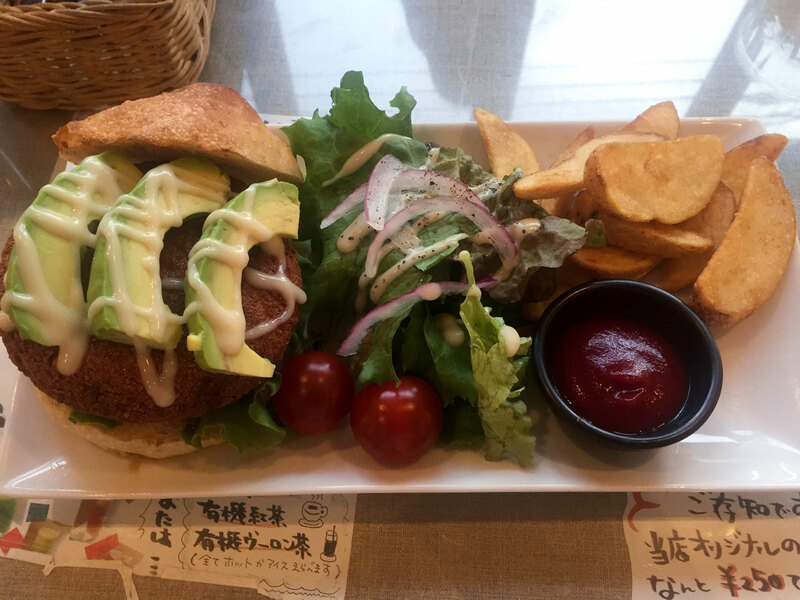 So what you’re about to read is “The Shy Vegetarian’s One Day Kyoto Itinerary.” Specific, I know, but I’m sure there are others like me out there. And if you are like me, finding travel info that fits this preference can be pretty hard to come by, so I hope this helps you as much as it would have helped past me! Starting point: I like to stay close to the Kyoto Imperial Palace so this day is ideal if you’re already near this area. I admit, I’m not a huge breakfast person. I don’t really like sweets and I don’t drink caffeine, but walking around a city you don’t know on an empty stomach isn’t the best idea. The first thing I do is stop by Choice Cafe and Restaurant for some quick vegan snacks to fuel my adventure. 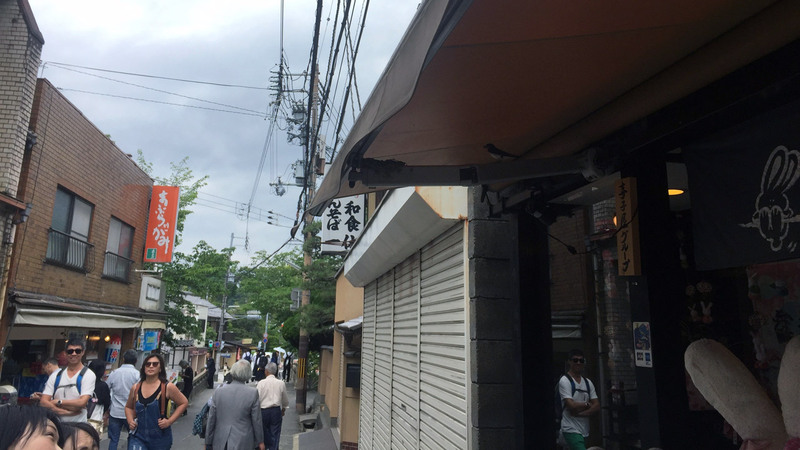 It’s less than a five minute walk from Sanjo Station. Walk east for almost a block, turn left, and you’re there. The entryway has black signs with the word “CHOICE” written on it in white, so it should be easy to find. If you get to the “Feel 京 Good” bar, turn around, you just passed it. Choice Cafe and Restaurant has a clean, modern feel, cloaked in whites and greens. There are English friendly menus and books on health, macrobiotics, and veganism. You could easily spend a few hours eating, drinking, and working from a laptop here. But for my purposes, I’m here to stock up on cheese; the vegan cheese plate, to be exact. 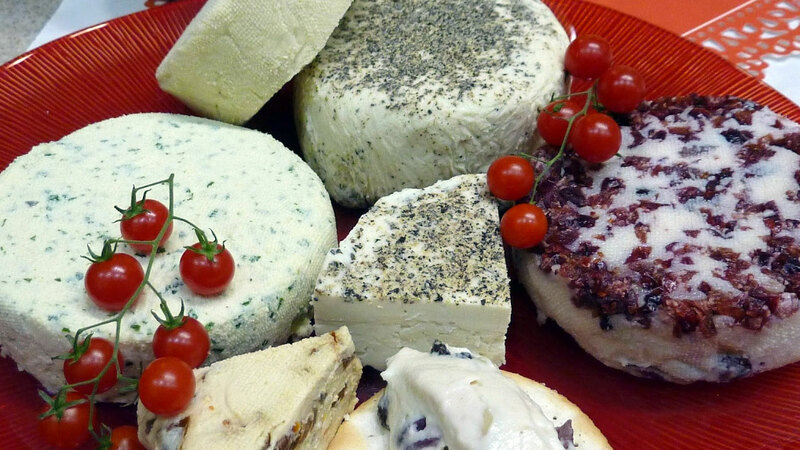 There are soft and hard cheeses, some cherry tomatoes, and it’s all delicious and made in-house. If you aren’t a huge fan of cheese by itself, they also have cheese risotto and a cheese hamburger with many different sauce options. Of course, there are also more mundane morning items like rum raisin cake and an acai bowl, which I sometimes default to if my stomach isn’t in tip-top shape. The goal here is just to get something in my stomach so I don’t get dizzy while I walk, so remember not to overdo it on the snacking. There’s more food to come. Now that I have some cheese fuel, it’s time to take advantage of the beautiful spring weather and head north to walk along the Kamo River. If timing and weather permit, it will be a beautiful spring day with all the cherry trees lining the banks in full bloom. It is a truly breathtaking sight. At this time of year the paths can get a bit crowded, but never so much that you’ll be pushing through people to get around. There are kids, teens, tourists, and everyone you can imagine out and about, enjoying the beautiful river that runs through Kyoto. If I wanted to rush I could probably do the walk in about 45 minutes, but that’s no fun. So I usually take my time, sitting when I can, enjoying the scenery, and drinking cold drinks from vending machines. 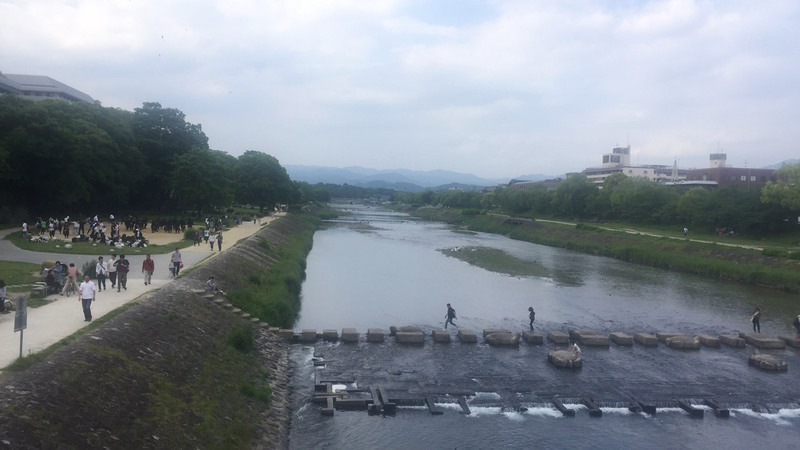 ONE STOP I ALWAYS MAKE IS KAMOGAWA PARK, THE DELTA WHERE THE KAMO RIVER AND THE TAKANO RIVER MEET. USUALLY THERE ARE KIDS WALKING ALONG THE STEPPING STONE PATH THAT LEADS FROM THE RIVER’S EDGES TO THE CENTER. I usually keep to the east side of the river, just because that’s the side of the city I tend to stay on, but there are many bridges and foot paths across if it strikes my fancy – or if I see a vendor or something I want to check out on the other side. One stop I always make is Kamogawa Park, the delta where the Kamo River and the Takano River meet. 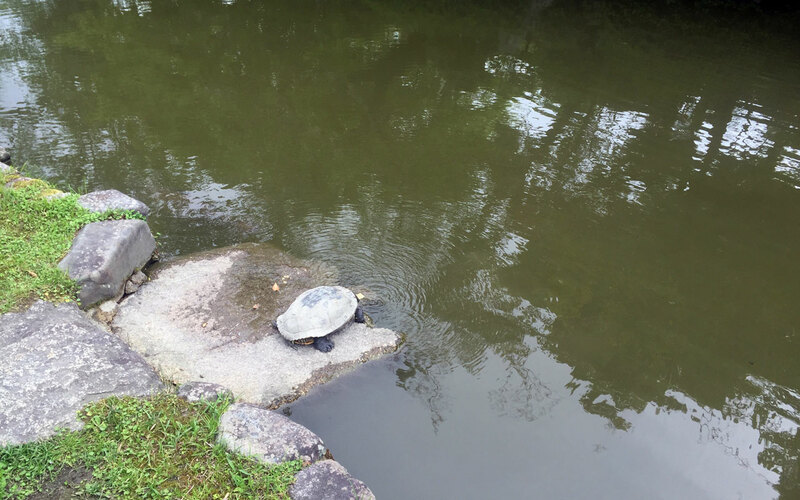 Usually there are kids walking along the stepping stone path that leads from the river’s edges to the center, and birds like ducks and plovers swimming or napping nearby. And I always see a few stray cats hanging out under the bridges watching the birds. I really love this walk. In fact, it would probably be wonderful anytime but the rainy season, when it can flood and become a bit dangerous. So I always make a point to walk some of it when I’m nearby. By now I’m hungry again, but for something light and fresh. 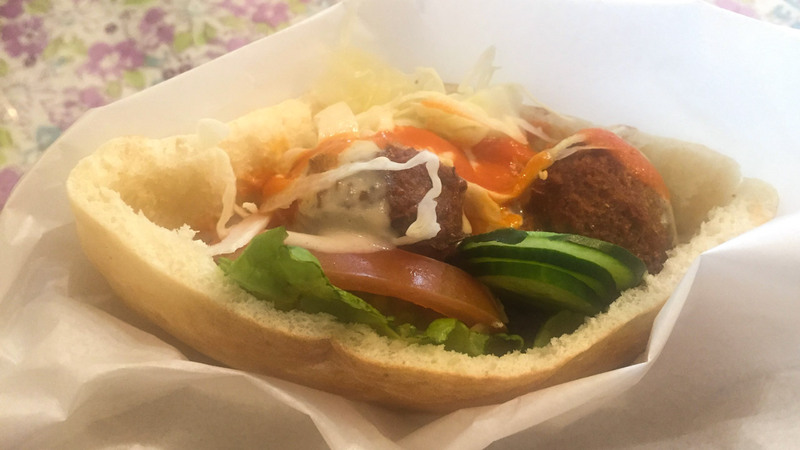 So I head just east of Kamogawa Park to my favorite pita place in the world, Falafel Garden. Okay, maybe falafel actually made in the Middle East is better, but I’ve never had those so my frame of reference may be off. But of all the pitas and falafel I’ve had, I like this place the best. You can order lunch sets which include fried potato wedges or rice and salad, but I prefer ordering exactly this: one falafel sandwich, one avocado sandwich with cheese, and a dry ginger ale. They have other veggie options, as well as chicken kabob for meat eaters, but this set meal is my go-to every time. They have a Japanese/English menu and the restaurant itself is pretty tiny, but the food is fresh and delicious. A pita is only as good as the sum of its parts; one watery tomato will ruin the whole experience. But the veggies in Falafel Garden’s pitas are always fresh and super flavorful. If I’m feeling hungrier than usual I’ll get a side of hummus, but that’s only ever happened once. Also known as the Silver Pavilion, Ginkaku-ji is a beautiful zen temple nestled in the northeast corner of Kyoto. This 13th century complex is usually much less crowded than the similarly named Kinkaku-ji, or Golden Pavilion. There is a large sand garden with a huge, shaped pile of sand that symbolizes Mt. Fuji. And while the pavilion, once coated in silver, may not be as grand as its cousin and inspiration (Kinkaku-ji), it’s still a wonder to look at. Most of all it’s extremely peaceful. Even with all the tourists who visit Ginkaku-ji, people seem to lower their voices and there seem to be less school field trips, too. 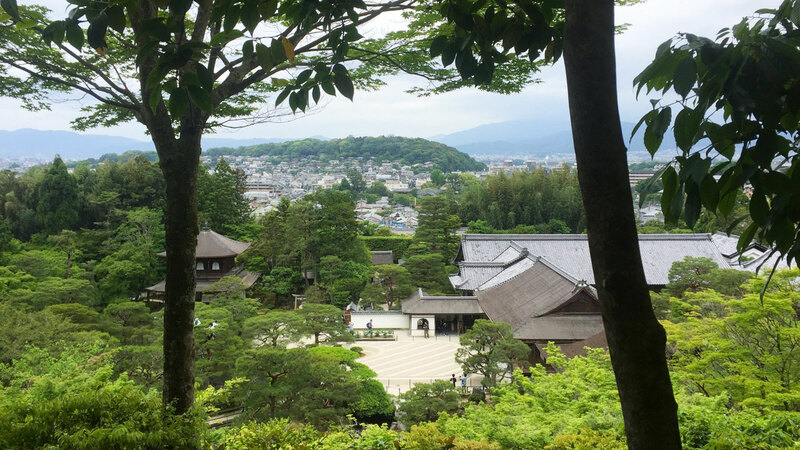 You can walk up behind the temple to get a lovely view of the entire complex as well as the city of Kyoto behind it. There is also a gift shop with every kind of omamori you can imagine. This is usually where I pick up my yearly omamori to protect against illness. Now we’ve arrived to my favorite part of my Kyoto itinerary, The Philosopher’s Path, known in Japanese as tetsugaku no michi 哲学の道てつがく　みち. During cherry blossom season the entire walk is coated in light pink blooms, but I prefer the lush green that follows in May. Plus, there aren’t as many tourists taking this walk around that time. 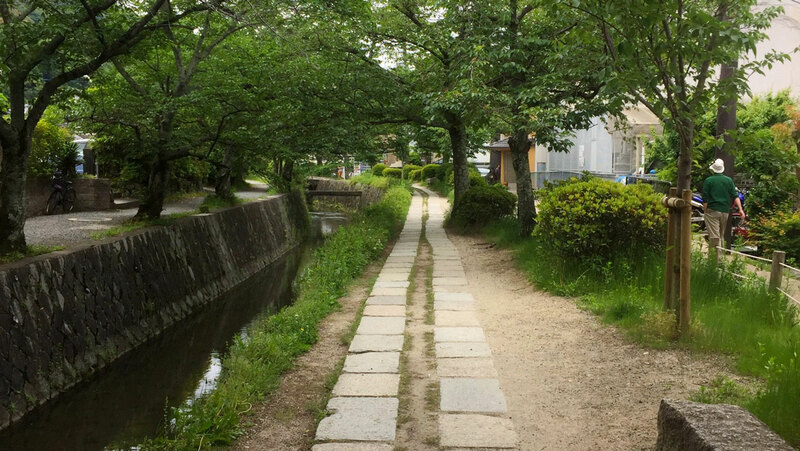 This path got its name from Japanese philosopher Nishida Kitaro, who apparently meditated while walking along this river every day on his way to teach at Kyoto University in the early 1900s. DURING CHERRY BLOSSOM SEASON THE ENTIRE WALK IS COATED IN LIGHT PINK BLOOMS, BUT I PREFER THE LUSH GREEN THAT FOLLOWS IN MAY. Just a few steps down the path is all you need to realize why someone would prefer this route, for meditation or otherwise. It’s just so peaceful. Because I like to go during the off hours, there usually isn’t anyone around other than a few locals. While I walk farther than the length of the path (it’s only about two kilometers long), there are stone benches, temples, and shrines along the way if I suddenly get tired or want a break. Kiyomizudera 清水寺きよみずでら is a huge, famous Buddhist temple that is super old, even by Japanese standards. It has multiple buildings and shrines and pagodas within the temple and is probably the most touristy stop I’ll go to today. Most people visit during spring for cherry blossoms, or fall for the changing leaves, but the crowds are much more manageable just after the blossoms are gone and the trees grow in thick. 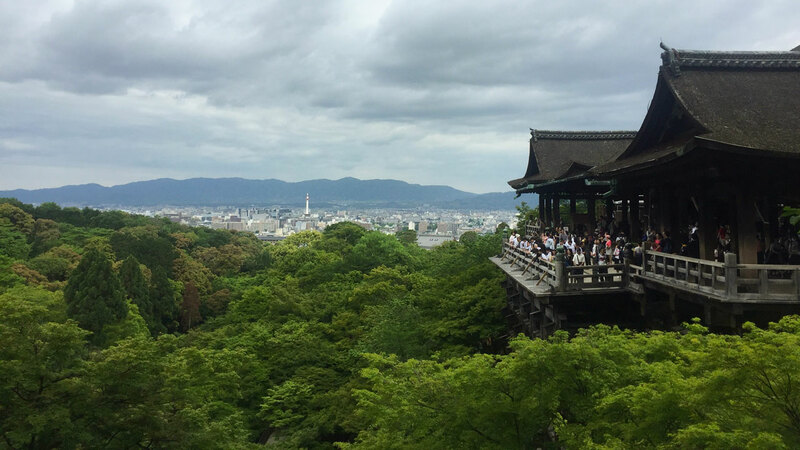 I don’t know why but there’s something about looking out at Kyoto through a sea of green that really gets me. This is also where I pick up omiyage for my friends and family. Even if you don’t find something in the temple itself, which is crazy because they have a lot, there are stores lining the streets leading up to it where you can find tons of stuff. From bags, to snacks, to pickles, to pottery, to masks – there’s usually something for everyone on my list. Bag of gifts in hand, I head back west towards the Kamo river. I follow it for a bit north and then usually cross at the second bridge/crossing and make my way through the city. While this walk isn’t nearly as peaceful, it’s nice to walk through populated city streets before it gets dark. Our last stop of the night is in Shinkyogoku shopping district to eat more delicious vegetarian food. But you have to be careful not to miss it; Mumokuteki Cafe & Foods looks like a clothing shop at first glance. Once you see the menu signs and the little plastic food stand out front though, you’ll know you’re in the right place. Step in, turn left, go up the stairs, and you’ll be at the super tiny Mumokuteki Cafe & Foods. I love this little place so much, it’s where I got dinner on my birthday last year (big thanks to Mami for recommending it to me in the first place). I LOVE THIS LITTLE PLACE SO MUCH, IT’S WHERE I GOT DINNER ON MY BIRTHDAY LAST YEAR. They also have yummy desserts like cheesecake and tiramisu. So you know I’m getting some of that too. Just watch out, there aren’t very many seats so there may be a bit of a wait before you can sit down to eat. But you can peruse the clothing and other things they have for sale if that’s the case. That’s it! From here I usually walk (or take the bus if my feet are broken by now) back to wherever I’m staying; usually about 20 minutes away if I’m staying near the Imperial Palace. From there I sit down, take off my shoes, and take a long bath. 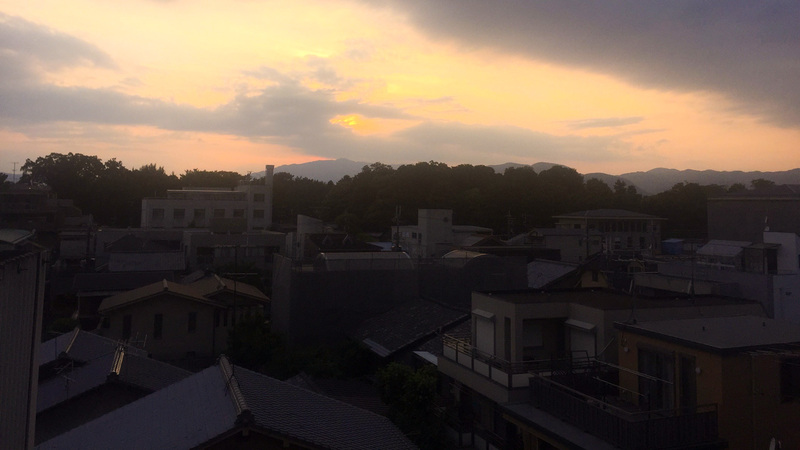 I read a book and cool down after my long day of walking, eating, and taking in the beauty of Kyoto around me.